Technology Toolbox highlights new products and technologies designed to improve asset reliability, maintenance productivity, safety, and cost efficiency. Plant Services Contributing Editor Sheila Kennedy focuses on a different functional area each month. Asset reliability is a maintenance organizations’ Holy Grail – highly desired yet difficult to consistently achieve. Fortunately, new software and technologies for predictive maintenance (PdM)[category/predictive_maintenance/?utm_source=internal_link_topic] andprescriptive maintenance (RxM)[category/prescriptive_maintenance/?utm_source=internal_link_topic] are bringing the goal closer to reality. Sheila Kennedy says further advances in 3D printing materials, technologies propel making on demand. Sheila Kennedy says make more-strategic decisions thanks to the power of AI and machine learning. 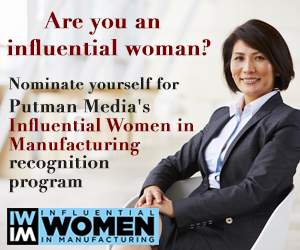 Sheila Kennedy interviews women in tech on how to seize the benefits of smart manufacturing. Sheila Kennedy says advanced analytics tools can help make RxM a reality for more assets, facilities. Sheila Kennedy examines how remote and predictive maintenance gets a boost via “smart contract” technology. Sheila Kennedy says digital twins and data analytics enable engineering, process improvements. Sheila Kennedy speaks with seven women leaders in manufacturing and asset management on what’s driving industry’s new revolution. Sheila Kennedy says explore innovative engineering tools that can help advance plant digitalization. From algorithms to hardware, Sheila Kennedy says the new maintenance frontier is coming into view. Sheila Kennedy says ultrasound is finding a greater role in electrical inspections and as a complement to other tests. Sheila Kennedy says enable operational improvements through pattern recognition and discovery tools. Sheila Kennedy says advanced technology allows for more-precise inspections, more-strategic corrections. Sheila Kennedy explores how technology is transforming asset management, from women leading reliability efforts at some of the country's top industrial organizations. Sheila Kennedy says the cloud offers new and more-interactive approaches to asset condition monitoring, analysis, and response. Sheila Kennedy explores add-ons to enhance your EAM/CMMS. Female leaders in technology and industrial production share their perspectives on the evolution of smart manufacturing and the unique voices that women bring to the table. Sheila Kennedy says integrated safety technologies are helping plants avoid their biggest hazards. A growing number of software and service offerings leverage the cloud to extend the reach and value of predictive and condition-based maintenance (CBM). In this month's Technology Toolbox, explore how 3D tech is revolutionizing plant infrastructure management. Get a better grip on protecting your plant, from securing ICS configurations to detecting explosives. Sheila Kennedy says smart systems enable secure remote access, optimize energy consumption across facilities. Sheila Kennedy says improve design visualization as well as plant maintenance and expansion tasks. Sheila Kennedy says reduced weight, minimal maintenance, and increased efficiency provide cost benefits. Sheila Kennedy says manage data before it manages you. Sheila Kennedy says solutions and tools fill Reliable Asset World/Ultrasound World X.
Sheila Kennedy unveils new innovations in data, manufacturing, material handling, and energy management. Sheila Kennedy says reduce mechanical-equipment stress, breakdowns, and maintenance. Sheila Kennedy says significant savings can result from proactively aggregating, monitoring, and analyzing energy data. Sheila Kennedy says take the risk factor out of dangerous or repetitive work. Sheila Kennedy says innovations improve flow control. Sheila Kennedy says vibration measurement, ultrasonics, and fluid analysis keep motors running. Sheila Kennedy says food-safe solutions, engineered surfaces, hydraulic handling, and inspection tools lead the innovations. Sheila Kennedy says assembly and conveyance benefit from new innovations. Sheila Kennedy says wireless networking adds speed, intelligence, and safety to industrial plants. Sheila Kennedy says monitoring services give maintenance the edge. Sheila Kennedy says predictive technologies can provide a benefit to electrical systems. Sheila Kennedy says new lighting technologies are making cost savings quicker and easier to achieve. Sheila Kennedy says new tools can help you manage steam quality, carryover, corrosion and energy consumption. Sheila Kennedy says better materials, design, protective devices and lubricants mean better bearings. Sheila Kennedy says high-tech selection, control, rewinds and energy monitoring are now available. Sheila Kennedy shows how energy storage, solar tracking, electric charging and waste-heat recycling can support energy systems. Sheila Kennedy, contributing editor, explores cranes, drum movers, walkers, lift carts and air conveyors. Sheila Kennedy, contributing editor, says industrial lighting is getting smarter, stronger and more energy-efficient. Sheila Kennedy, contributing editor, says advanced chemistry gives industrial coatings new possibilities. Sheila Kennedy, contributing editor, says cut power consumption during periods of peak price or demand. Sheila Kennedy, contributing editor, says tools and equipment that harvest sunlight are growing in number and scope. Sheila Kennedy, contributing editor, says use these methods to confirm the integrity of tubes and tube sheets. Sheila Kennedy, contributing editor, says propane and lead-acid are so 1990s compared to the options. Sheila Kennedy, contributing editor, says examine the integrity of an object, material or system without harming it. Sheila Kennedy, contributing editor, says new technologies are advancing our abilities to contain unsavory emissions. Sheila Kennedy, contributing editor, says once-exotic LED, OLED and nanotechnologies are moving mainstream. Sheila Kennedy, contributing editor, says a worldwide effort will shrink the energy footprint of motor systems. Sheila Kennedy, contributing editor, explores thermal indicators, no-cure coatings, diamonds and plant batteries. Sheila Kennedy, contributing editor, explores how refinements broaden applications, improve reliability and reduce costs. Sheila Kennedy, contributing editor, explains how new technologies can ease the task of avoiding downtime and cost. Contributing Editor Sheila Kennedy demonstrates how signals from industrial-strength units can even penetrate metals. Contributing Editor Sheila Kennedy reports that high-tech options have steel, brass, copper and other metals on the run. In the New Year, Contributing Editor Sheila Kennedy says the flowering of technology will help green your plant. Contributing Editor Sheila Kennedy explains how to optimize compressed air quality, moisture, energy and priorities. Contributing Editor Sheila Kennedy reports that construction changes are improving energy efficiency, reliability and process control, and for good reason. Are plant surveillance technologies compromising your privacy? Sheila Kennedy reports on how today's camera systems do more than snap pictures or videos. Sheila Kennedy says crisis management benefits from a dose of high technology. The goal of a variable-speed drive (VSD) is to modulate motor speed to reduce power demand and generate energy savings. Drive options constantly change, and how you match motor and drive affects system efficiency. Understanding the VSDs effect on speed and resonant frequencies can reduce a motors life-cycle cost. High fuel costs, strict emission regulations and environmental and safety concerns are inspiring innovation in flow and emission management technologies. A variety of health and safety standards, environmental regulations and federal programs are influencing development of new floor care products. Among the goals of the green flooring initiatives are minimizing toxic ingredients, chemical releases and frequency of stripping and recoating. New techniques are being developed to minimize the onus of repairs and frequency of replacement, and to convert roofing liabilities into energy-producing assets. Industry and Mother Nature have both developed highly efficient motors. Historically, mechanical seals were designed with very flat, parallel faces, and nearly a century passed before this basic principle saw any notable change. New and emerging manufacturing technologies provide greater flexibility in seal design, the goal being greater reliability, even in the most demanding applications. In this month's Technology Toolbox, Shiela Kennedy writes that nanotechnology-based liquid and solid lubricants may last forever. Keys to keeping air compressor systems from putting downward pressure on the bottom line. Originally designed for consumer use but quickly adopted for military and government applications, floor cleaning robots are evolving steadily and increasingly appealing to managers in a range of commercial establishments. But, their readiness for industrial environments depends on the application. Monitoring power output in real time reveals the true capability of a drive system. Rotating equipment can feed real-time operating data into your plant network. Remote diagnostics can assist you in picking up some efficiency in your plant. Read Contributing Editor Sheila Kennedy's piece on this innovation. Corrosion is inevitable in your plant and reduces the useful life of equipment and increases the risk of litigation. Learn how to monitor corrosion and save on corrosion-related costs. Businesses operating in a deregulated energy market are free to choose their electricity provider. Perhaps its time you look around and see if you can save on energy costs. With the right incident tracking software, you can reduce recurrent failures, improve safety and reliability, save and avoid costs, and improve performance. Read about some fun ways to generate interest in your profession. There is no ironclad method of securing your plant from every possible emergency. There are, however, reasonable and responsible steps that you can take to mitigate your greatest security challenges. Do VSDs always generate energy savings? Contributing Editor Sheila Kennedy explains how a plant-wide assessment of energy usage can lead to significant bottom-line cost savings and increased competitiveness.